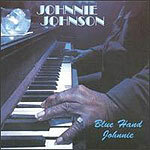 CD review: "Blue Hand Johnnie"
Johnnie Johnson has spent most of his professional career pigeonholed as a footnote to musical history  he played piano fro Chuck Berry when the rock 'n' roll pioneer was first breaking through with Chess Records in the mid-'50s. Since then, Johnson's own considerable chops have been largely overlooked in favor of asking him, "Say, aren't you the dude who played behind Chuck Berry?" Johnson has now released his own album. While the material on "Blue Hand Johnnie" is uneven, as are the backing players, Johnson's own playing is stellar. Johnson plays a jazz-influenced barrelhouse boogie style of piano like a cross between Professor Longhair and Jay McShann. Johnson, from St. Louis, was definitely influenced by the neighboring Kansas City sounds of McShann and Count Basie, as he uses his left hand to comp the rhythm while using the right for trills and other ornamental features. Most of Johnson's debut album consists of original songs composed by saxophonist Oliver Sain. But there are a few covers worth a mention, too. Johnson and Sain give Ma Rainey's "See See Rider" a good going over, with a slow but never plodding rendition. Sain's impassioned tenor work plays well off Johnson's Kansas City stylings on piano. Jimmy Reed's "Baby What You Want Me to Do" is made far less effective by the poor match-up of vocalists Barbara Carr and Stacy Johnson. When singing alone, either is inspirational. But Stacy Johnson's rough-and-ready style seems to cancel out Carr's more gospel-tinged vocals for a result that is bland and detracts from Johnson's playing. Berry's "Johnny B. Goode" is apparently tossed in as a nod at the past. Ironically, it was Lafayette Leake who played piano on the original recording of Berry's hit (although Johnson doubtless played it numerous times in live performances, when he later rejoined Berry). The best of the original material is Sain's and Johnson's "O.J. Blues." The two obviously have a rapport, playing against each other as they trade leads and riffs. The song is a contemporary Chicago-style blues instrumental and consists mostly of Sain or Johnson taking 12 bars and doing with it what he will. However, the guitar playing here  as throughout the album  is not up to the standards of the rest of the musicians. Both Herb Stadler and Steve Waldman are passable technically, but both seem more rock-oriented than blues or jazz. Dave Pruitt, who as part of the Bel Airs backs Sain and Johnson on two cuts, is the best of the guitarists with imaginative solos and a clean sound. Carr's best performance is on "Black Night." With a big-as-the-Montana-sky voice, Carr sounds not a little like Lou Ann Barton. Oddly, there is what surely must be an organ on this song, although none is listed in the liner notes. On "Johnnie B. Goode," though, Carr seems asleep. Indeed, no one in the band seems too excited about the song, lending more weight to the thought that its inclusion was an empty gesture meant to cash in on Johnson's footnote status rather than reflect his instrumental prowess. On "Talkin' Woman," Stacy Johnson gets to show off his vocal chops. With a gruff, Clarence "Gatemouth" Brown approach, he's a fine partner for Johnnie Johnson, whose piano here sounds more like McShann than ever. And Pruitt's guitar work is equally tasty on this piece. It is easily the best non-instrumental on the album. Still, it is the instrumentals that shine brightest. After all, we've had a lifetime of hearing Johnnie Johnson back someone else  on his album, we want to hear him.